I remember the first time I saw Soldiers and Sailors Monument lighted at Christmas in downtown Indianapolis. The ten year old child never forgot the beauty of seeing so many lights on what is dubbed by some, as the worlds tallest Christmas tree. For that little girl, it was a mesmerizing sight. 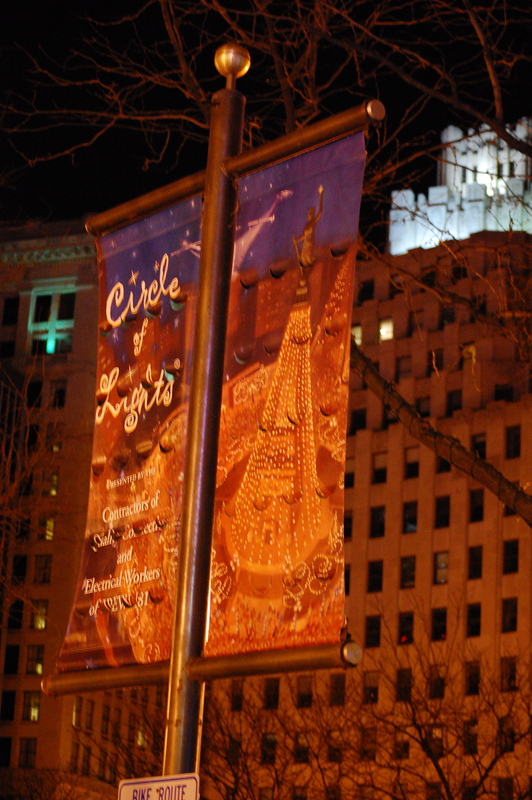 It’s still amazing to visit Monument Circle during the holidays, partly to enjoy the beauty and partly to satisfy the memories of a little girl. Walking around the Circle, people stop every few minutes to admire the monument all dressed up for the holidays. It’s magical! While the memories of yesteryear are firmly planted in my mind, it’s more exciting for me as an adult. When I was a child, the only time we went downtown was to see the Monument at Christmas or to buy shoes at Stouts when school started. Today, downtown Indianapolis is a vibrant, active city! I find myself drawn to downtown this time of year. It’s an atmosphere that requires more than a quick trip around the circle. The lampposts are decorated, the mall is buzzing, the Indianapolis Zoo at White River State Park is embellished with hundreds of thousands lights. It’s worth putting on my winter gear to brave the cold and enjoy the wonder of it all. Another favorite activity of mine is to drive or walk through the Historic Homes neighborhoods during the Holidays. When my family would make the trip downtown, we headed south on Meridian from 56th St. I would be the one seated by the window, so I could see all the big beautiful homes, so elegantly decorated. I didn’t know then, it was the architecture of these homes that captivated me and still does today! A leisurely drive down the cobblestone streets of Lockerbie Square or a tour of Benjamin Harrison’s home in the Old Northside still brings a sense of wonder and excitement. Today, I enjoy these activities with my children and grandchildren. They, in turn, will have their own memories and favorites to celebrate during the holidays and carry it forward to the next generation. Maybe, they’ll develop a love of the historical beauty of our city their Mimi so enjoys.